I had slept well and as usual I was up early updating my notes at 3 o'clock. Hagi-san started stirring about an hour later and was awake too. He'd told me the previous evening that he usually got up early to massage his muscles and do a little stretching. For 76 he really was a very fit old man. Around 5:30 the pair of us starting packing up and getting ready to go the prayer hall. We entered through a side building adjoining the prayer hall and made our way to the front of the altar. The head monk was already there to welcome everyone. There seemed to be about 15 people present in total including Hagi-san and myself. At 6 o'clock sharp with everyone including the very young trainee monk, the monk who had stamped my book yesterday, the temple helper present, the head monk started a chanting routine that the other temple staff chanted along with too. I took out my own heart sutra text and joined in with everyone else for that part. Each person, including myself, then took turns to come to the front offer incense and prayers. Once the chanting was over the head monk retired from the main hall and the monk who had done my stamp yesterday took over. Even yesterday he had looked like a mountain of a man sitting in the window to the stamp office and today, dressed in his monks robes he stood towering over me. He spoke in a loud clear voice and started by telling us about his background. He had started adult life as a regular salaryman but after visiting Koyasan, details of which I didn't completely catch he had ended up here at Senyuji (#58) as monk of a very nice mountain top temple. He kept repeating one particular word which I couldn't understand but I understood the gist of his overall message. His basic message to those going around the temples was to enjoy the experience and to feel the spirit of Kukai. The word he was using I believed meant faith, so the gist of his short sermon was to do the pilgrimage with faith. His talk was over almost as soon as it had started but he had delivered his message clearly. I returned to the tsuyado to get my pack ready. Hagi-san left a little ahead of me in order to pray at both halls. Before leaving the tsuyado I decided to give one of my two emergency dorayaki I had to the young monk in the other room. He was out so I just put one in a small plastic bag and hung it on the door handle knowing he would find it later. He returned just as I was about to leave and I told him the dorayaki was for him. He didn't seem to know what to say but he went into his room and returned with a small good luck charm and handed it to me. I had already given Hagi-san a photograph but I wanted to say goodbye to him before I left so I headed back to the main hall. I found Hagi-san just outside the main hall where he had just finished getting his book stamped and it was there that we said our goodbyes. He gave me a good strong handshake and like that we both went out opposite ways. Walking in reverse he would head to Eifukuji (#57) and for me, the next temple was Kokubunji (#59). Before leaving Senyuji (#58) I decided to go back to the stamp office to speak to the monk who had stamped my book yesterday. He could speak some English so I asked him what the word he had been using was and what it meant. He couldn't tell me in English so he got up and returned with a small dictionary and looked up the word. The word translated basically as belief or faith. I was not a Shingon Buddhist and I didn't really know too much about Kukai the person but I had faith in a universal force, power, spirit or whatever it could be called. Like I did during my first pilgrimage, this time too, I had faith in the belief that I was not doing this pilgrimage alone. 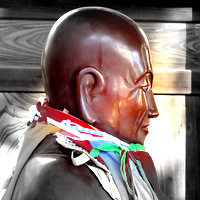 The spirit of Kukai was manifest everywhere in Shikoku. My plan today was to get through Kokubunji (#59) which was 6.1km away and then try and make it to Yokomineji (#60) a further 27.7km on. Yokomineji (#60) was a temple many mentioned as a tough one to get to because the final 2.2km was up a very steep mountain trail. The last time I had planned my journey so that I arrived in the morning and could then continue down to the next series of temples. This I time I had learned from Hagimori-san that it was possible to stay in the large enclosed rest area on the temple grounds. This made my planning much easier. Plus if I didn't want to continue to Yokomineji (#60) and decided on another short day, there was also the option of stopping in a tsuyado at Komyoji. Komyoji was a temple near to Iyo-Miyoshi Station and along the ohenro trail. It was a beautifully bright start as I left Senyuji (#58) as I headed down the steps to the main gate. Just a little further on from the main gate I joined mountain trail and it provided great views of Imabari City below and beyond that the sea. After coming of the mountain trail the landscape changed to wide green open fields and it contrasted really nicely with the equally huge expanse of blue sky. I then just followed the trail markers all the way to Route 196 where I saw the welcome sight of a Lawson. I stopped for my usual coffee and dorayaki starter. It was still early but the day was starting to warm up so before heading on to Kokubunji (#59) I removed all my extra layers. It wasn't long before I arrived at Kokubunji (#59) and like the first time it was largely deserted. The first thing I did was get the important business of prayer rituals completed. I then sat down and looked at my guide book and thought about the different options I had. As I was doing this I noticed an elderly woman walk around the large black strange egg shaped object with Japanese characters for nose, ear, eye and so on written around the top. The woman seemed to be touching characters as she went round. I knew this time that the object was called a tsubo and I guessed it had something to do with good health. At several temples I had seen statues of a seated figure with people typically stroking the knees and heads of these statues. 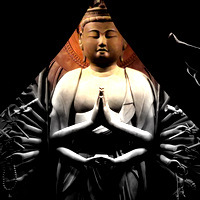 Next to the tsubo was a standing statue of Kukai with his hand outstretched. I watched a man shake hands with Kukai and maybe this was another means of receiving Kukai's blessing. Before heading to the stamp office I walked around the tsubo and shook hands with Kukai. There were two young men working in the stamp office and being the only one there I soon had my booked stamped. I offered the photographs to the one who had done my stamp and he picked one and then handed the rest to the other one who also picked one. They were both thanking me when a young boy appeared from the back curious to know what was going on. I offered him a candy and he took it in a flash. I headed back outside and got my pack together and decided my first plan of action would be to walk almost 19km all the way to Family Mart, eat something, rest and pick up more supplies and then complete the final 9km to the temple. If I got to the Family Mart around 2 o'clock I figured I had a chance to get up there in time for my stamp too. I hadn't even gone an hour before I decided to take a quick break at Imabari Yunoura michi-no-eki. It had turned into in a really warm day and so I removed my final layer so that I was now down to just my long sleeve white jacket. Feeling more comfortable I pressed on. As I came around a bend in the road I found Olaf taking a rest at the side of the road. I had first met Olaf on the way back from Kongofukuji (#38) and on that occasion he had seemed a bit troubled because he had not been able to get withdraw money from the cash point. This time he seemed to be perfectly fine because he had been joined by his 30 something son Philipp. Philipp had just flown directly from Germany and arrived in Imabari yesterday to rendezvous with this father and today the pair of them were continuing the pilgrimage together. Olaf had already visited Kokubunji (#59) and like me his next temple was Yokomineji (#60). I had not spoken much to Olaf the first time but this time I found out that he had been sleeping out along the way too. I gave them each a photograph and told them about the lodging list on my website. I also told them about the rest hut which was available at Yokomineji (#60). With that we parted company with a tentative plan of catching up at the rest hut later in the evening. I had been worried that it would turn into a really hot day again but thanks to the haze the temperature seemed to remain quite comfortable. I maintained a pretty steady tempo and just kept going. Apart from Olaf and Philipp, the only other person I met was a woman who stopped her car to give me a small bag of sweets. Along the way I started getting clear views of Mt. Ishizuchi far away on the horizon and it got me thinking about the viewing spot not far from Yokomineji (#60). 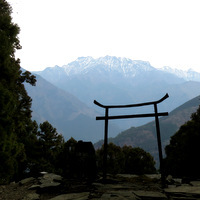 There was a small shrine gate and beyond that a great view of Mt. Ishizuchi. I had only seen photographs online of this view and was hoping to see it for myself. I arrived at the Family Mart on Route 11 at 13:30 and since this would be the final stop before heading up, I got myself my usual treats and stocked up on some extra supplies for the evening. I also picked up some extra water since there would be no more vending machines until I got to Yokomineji (#60) which I remembered had one conveniently situated just as you passed through the main gate. I had everything I needed so I headed out and got myself going again. A Shikoku trail sign indicated that it was 9.5km to Yokomineji (#60) and my guide book told me it was 8.2km. Whatever it was I was reasonably confident I could make it there by 5 o'clock. The incline near the start was fairly gentle and I continued on at a fairly gentle pace until I passed the hut I had slept in during my first pilgrimage. The last time I had stopped at this hut in the dark and couldn't really see much around me. Now in the light of day it looked far less isolated than I remembered. Once I had passed I decided to pick up the pace and have a little fun. My leg was no longer hurting so I covered the first 5km in less than an hour but the next 1km to the final rest hut steepened to a 12% gradient which slowed me right back down again. It was just after 3 o'clock when I stopped at the final hut for a quick 5 minute break. As I joined the mountain trail proper a signed indicated it was 2.2km to Yokomineji (#60) and I felt pretty good. The first half was nice and steady but the second turned out to be a lot harder and I took several short breaks along the way. It was a tough little hike but it was hugely enjoyable too. I arrived at Yokomineji (#60) just after 4 o'clock and I had made it all the way from the Family Mart to the temple in 2 hours and 20 minutes. The competitive strain in me had helped propel me along at a much faster pace than I had imagined. The first thing I did was get myself a nice cold drink from the vending machine and then headed for the stamp office to find out about staying in the hut. The 2 office staff were busy with a pile of stamp books belonging to a bus group which was further up by the prayer halls so I waited for the stamp office to finish before going in. Outside I asked a man who seemed to have hiked up himself if he knew about the viewing spot and he said he didn't but he started searching for it on his smartphone. He asked a couple of other visitors and none of them knew but then I asked him to ask a temple worker who was passing by and he told us that it was just back out of the main gate and left for about 600m. The man who I had asked for help about the viewing spot was now also really interested in seeing it for himself. I wanted to get my temple stamp out of the way and confirm that I could stay. The man came into the stamp office with me, he did the talking for me except the bit where I asked the office staff to choose a photograph they liked. There was also good news about being able to stay in the rest hut tonight too. If that wasn't enough good news the woman in the statf office said she wanted to give me something and returned with 2 small dorayaki but not just any old dorayaki, these ones had cream in the middle I got one and the man who had helped me got one too. I left my pack in the rest hut and the pair of us headed up to the viewing spot. Along the way he gave me 1000 yen and said an old woman had wanted us to share the money but it was OK if I took it. Whether he was telling me the truth or not I didn't know but I decided we should do as the lady said and split the money. It took us no time at all to get to the viewing spot and it turned out to be even better than either of us could possibly have imagined. From a small clearing, beautifully framed by the trees, was this quite wonderful view of a partially snow covered mountain range with the highest peak being Mt. Ishizuchi. What really made it very special was this deceptively small shrine gate which came up to my shoulder but created this wonderful perspective. I was already looking forward to returning the following morning at sunrise. The pair of us then headed back down to the temple. The man turned out to be from Marugame in Kagawa where I had lived for 2 years. He had driven from there just to visit the temple and was going to head back down to where he had left his car and then drive home again. I would have liked to have made plans to meet him again when I got Marugame in a few days time but as usual I didn't ask and the chance was lost. I had also not asked Hagi-san for his details this morning and that I had really regretted. Anyway, it had been a fun end to the tough hike up to Yokomineji (#60) and I was happy that I had been able to share that view with someone. We said our goodbyes at the main gate, he headed down and I headed back to the hut to clear a space to set up my tent. The hut was fully enclosed and close by were excellent toilet facilities. There were two long tables on either side of the hut and I moved one over to the side which created plenty of space for my tent. After setting it up I went back outside and plugged my laptop into an outdoor socket. and sat there updating my notes. It was starting to get cold and also starting to get dark and I wondered what had happened to Olaf and Philipp. I was back in my tent when I heard voices outside and getting out of my tent I could make out someone with a headlight and on closer inspection it turned out to be Olaf and Philipp. After a quick update they got themselves ready for some sleep. The pair of them must have been quite tired because they settled down very quickly and just as quickly fell asleep and started snoring. It had been a long day. It had started with the morning service at Senyuji (#58) and now here I was 12 hours later at the top of a mountain at Yokomineji (#60). In a few days time the journey through Ehime would be over. Tomorrow I would probably be able to cover four of the remaining five Ehime temples and then it would be on to the final temple Sankakuji (#65) before heading up to Unpenji (#66) which was actually back into Tokushima and then finally I down into the final prefecture, Kagawa. Today was day 34 and looking back to the first pilgrimage, I was back at Ryozenji (#1) on day 38. This time I expected it would be at least another 10 days before I got back to Ryozenji (#1). I didn't know why I was thinking about the end but the truth was, I was well past the midpoint of the pilgrimage and the end would invariably arrive whether I liked it or not.